Saturday 6 January saw the first pelagic birding trip of 2018 being run from the Cape with Cliff Dorse the guide on board. We boarded our boat in the picturesque Simon's Town harbour and were soon running through the very flat False Bay towards Cape Point. As always, the spectacular Cape Peninsula in the warm morning light kept everyone entertained. Shortly after rounding the point, we encountered our first tube-nose of the day, a Northern Giant Petrel. There were good numbers of birds about and besides the Swift Terns and Cape Gannets we soon started seeing our first White-chinned Petrels and Sooty Shearwaters. We also witnessed the occasional Parasitic Jaeger, most of which were pre-occupied with harassing Swift Terns. A few miles further we started seeing Corys' Shearwaters. There were large numbers of these attractive north Atlantic breeders about and they proved to be the most common Procellarid of the day. At about 16 miles we detoured to visit two shark diving boats that were chumming and had good numbers of birds in attendance. 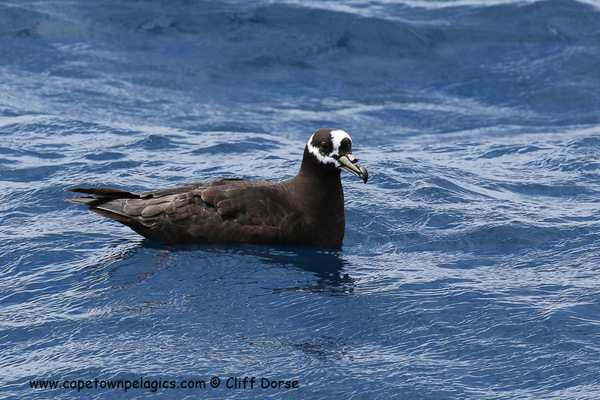 The mass of birds comprised primarily of White-chinned Petrels, Cory's and Sooty Shearwaters. We decided to continue out towards the deep although there did not appear to be any fishing vessels in the vicinity. As we progressed, we saw our first European and Wilson's Storm Petrels. Our first albatross of the day was an Indian Yellow-nosed. It was only at ± 20 miles from the point when we eventually saw our first Shy Albatross. We could see some recreational fishing boats to the south and we headed in their direction. As we got closer we could see that we were lucky enough to have found a long-lining vessel. We were almost at the long-liner when our skipper, noticed a whale blow. We were all ecstatic to see a huge Sperm Whale hyperventilating on the surface. After a couple of minutes, the majestic animal slowly rolled and lifted its tail completely out of the water as it slipped vertically down for another deep dive. It was a real privilege to have such a close encounter with the largest toothed predator in the world! We then focused our attention back on the birds and the long-liner. Our timing was perfect and she had just started to retrieve her long line of hooks. We worked slowly through the accumulating birds and added a Black-browed Albatross, Antarctic Skua and both Southern and Northern Giant Petrels. We diverted slightly to the west to investigate an intense bit of feeding action. Here we had good views of two Manx Shearwaters and encountered our first Sabine's Gulls of the day. We then returned to the long liner and were elated to find at least three different Spectacled Petrels in the vicinity. It is always special to see this species which is an endemic breeder to Inaccessible Island in the Tristan da Cunha group. Two Atlantic Blue Sharks joined the birds in scavenging on the by-catch and offal discarded by the boat. We also eventually managed good looks at a few Atlantic Yellow-nosed Albatross and had two flybys from Great-winged Petrels. We were now 25 miles from the point and the westerly wind had started to strengthen as predicted. We decided to run back towards terra firma and have lunch inside the tranquil waters of False Bay. We then visited the Bank Cormorant breeding colony at Partridge Point where we also encountered Cape and White-breasted Cormorant. It was then back to the Simon's Town Harbour for a well-deserved cappuccino! A message from Cape Town Pelagics: A huge thank you to our experienced skippers who are able to safely lead us to the best birding areas and skillfully manoeuvre the boat into just the best position while all on board are busy concentrating on the birds! Coordinating a pelagic trip over a year in advance with guests from all across South Africa and different countries around the world requires an organised office team. We thank them for their special eye for detail - and for the sometimes last-minute rearrangements and frustration if the weather delays the trip to another day! Our biggest thank-you is to our Cape Town Pelagics guides who take time out of their work, often involving seabirds and conservation, and time away from their families, to provide our guests with a world-class birding experience. 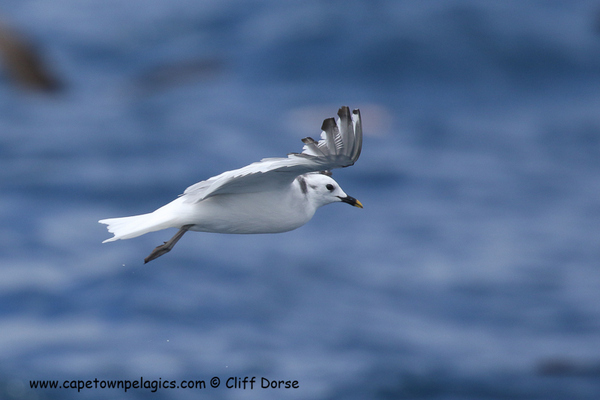 Cape Town Pelagics donates all it profits to seabirds, and so all the participants who join the trip make a contribution towards bird research and conservation - a big thank you from all of us. 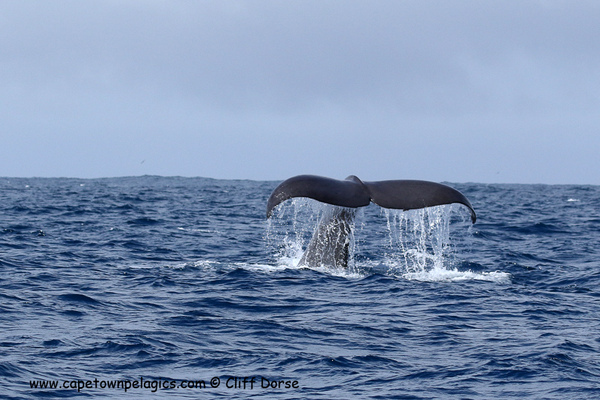 Trip Report by Cape Town Pelagics guide Cliff Dorse. To book, simply email or phone us, or submit a booking enquiry online.